We’d love your help. Let us know what’s wrong with this preview of Enthusiasm by Polly Shulman. Julie’s best friend, Ashleigh, is an enthusiast. Julie never knows what new obsession will catch Ashleigh’s fancy, but she does know she’s likely to be drawn into the madness. The problem with Ashleigh’s craze this time, however, is that there is only one Mr. Darcy. So when the girls get a part in the boys’ school musical, what follows is naturally equal parts comedy and romance, as a series of misinterpreted—and missed—signals, dating mishaps, and awkward incidents make Julie wonder if she has the heart for True Love. To ask other readers questions about Enthusiasm, please sign up. Ummm....I'm going to need more than that as a synopsis, does anybody think they can do a better job than that very obscure synopsis? This is one of those books that's cute and fine and everything but just so boring that I can't even bring myself to say anything in a review. It's a nice but forgettable read. I'll just leave it at that. This is a sweet YA romance, an homage to Jane Austen. The characters are delightful, and the salutes to Austen a great deal of fun. Julie, the first person narrator, has been best friends with Ashleigh since early childhood. Ashleigh gets Enthusiasms, and when she does, she goes whole hog. Her latest is Austen, and of course she is determined to meet a Darcy. She sweeps shy Julie along in crashing a dance at a snazzy prep school, where they meet a couple of cute guys, one of whom is Julie's secre This is a sweet YA romance, an homage to Jane Austen. The characters are delightful, and the salutes to Austen a great deal of fun. Julie, the first person narrator, has been best friends with Ashleigh since early childhood. Ashleigh gets Enthusiasms, and when she does, she goes whole hog. Her latest is Austen, and of course she is determined to meet a Darcy. She sweeps shy Julie along in crashing a dance at a snazzy prep school, where they meet a couple of cute guys, one of whom is Julie's secret crush. Ashleigh also thinks him cute, only what happens when both girls feel they are Lizzie Bennet and are attracted to the same Darcy? This book is so sugary sweet you could say maybe it almost too sweet. But as it is it's just what I needed. I was in the greatest mood while I was reading it and after I finished. This is probably the reason why I don't read as much deep sad books. You know how you sometimes keep the feel of the book while you're reading it for a while? If I'm having a hard time then there is no way I'm going to read a sad book. I have to be in the right state of mind. Julie has a friend name Ashleigh, who is an This book is so sugary sweet you could say maybe it almost too sweet. But as it is it's just what I needed. I was in the greatest mood while I was reading it and after I finished. This is probably the reason why I don't read as much deep sad books. You know how you sometimes keep the feel of the book while you're reading it for a while? If I'm having a hard time then there is no way I'm going to read a sad book. I have to be in the right state of mind. Julie has a friend name Ashleigh, who is an Enthusiast who does things to the extreme. For a few weeks it's a band, then the next it's Jane Austen. Through a series of mildly awkward but usually surprisingly fun encounters Julie finally finds a guy who she likes and who just might be into her too. The family life was done pretty well I think. Julie has a few issues but is doesn't completely fall into the same clichés of divorced parents. I think the best part of the book was Julie being such a good friend and Ashleigh is so loyal too. She and Ashleigh are just so loyal and good to each other even though Julie has to fight so many emotions. The second best part was the romance. It's all just right there. It could all work so perfectly if just one person would open up and make the right move. But back to the book, I think this was supposed to be a loosely based on one of Austen's books, or maybe a few of them? I'm not sure really but it doesn't really matter. It didn't have as much Austen as I thought it would. I honestly didn't look for any Austen references after a while. I love Jane Austen. I have read all of her completed novels at least twice. I've read quite a few JA para-lit novels, and this is by far the best of the bunch. It includes allusions to not only P&P, but Emma, Persuasion, Sense and Sensibility, and even a little Mansfield Park, too. Although she borrows from Austen's characters, Shulman does a great job of making them (and the story) fresh and unique. There was never a doubt in my mind as to the ending (it is, after all, a romance, and a YA o I love Jane Austen. I have read all of her completed novels at least twice. I've read quite a few JA para-lit novels, and this is by far the best of the bunch. It includes allusions to not only P&P, but Emma, Persuasion, Sense and Sensibility, and even a little Mansfield Park, too. Although she borrows from Austen's characters, Shulman does a great job of making them (and the story) fresh and unique. There was never a doubt in my mind as to the ending (it is, after all, a romance, and a YA one at that), but getting there was so much fun! I wanted to read it all over again after I finished, and I probably will at some point in the future. I'm loathe to give out any details of the book, because I want everyone to discover it for themselves, but I will say that musical theater (more specifically, a musical version of A Midsummer Night's Dream) comes into play. There are also sonnets, chocolate turkeys, fun new words (like "igsome" - "ig" for short - which is used to describe something/someone bad), romantic mix-ups, and all the usual high school drama. Recommended to Hannah by: Hanneybean!! Enthusiasm is a fluffy, comfy book filled with references to Jane Austen and some of her works, most notably Pride & Prejudice. A YA book, it was recommended to me by my teen daughter, so of course I had to read it. A quick, fun read, with a cast of cute and quirky (though unrealistic at times) characters, Enthusiasm is definitely marketed to capitalize on the teen fascination with boys, crushes, first kisses and clueless parents. Very sweet and light fare, although as a mom I do take issue wi Enthusiasm is a fluffy, comfy book filled with references to Jane Austen and some of her works, most notably Pride & Prejudice. Very sweet and light fare, although as a mom I do take issue with the current trend in having male characters enter the heroine's bedroom at night to *just cuddle*. Sure, it might sound romantic and squee-worthy when you read it in a book, but girls, please trust me on this one: if a boy climbs into your bedroom at night, he's got more on his mind then a cuddle and a good night's sleep. This book is definately for the light of heart, teenage girl. Which is exactly what I happen to be. I found a lot of connections between this book and my self. I am a lot like the main character Julia. We both have an extreme love of the Jane Austen novel Pride and Prejudice, we both love, even though we might not show it all the time, our very best friend more than anything, and would do almost anything for them, and we both hold on dearly to the dream that we will one day find our very own Mr. Darcy. Though this book makes a lot of refrences to Pride and Prejudice it remindes me more of Austen's Emma. Ashleigh, Julia's best friend, reminds me a lot of Emma Woodhouse. Just like in the novel, there is much confusion about who loves who, and how to go about making those you love, fall in love with you. Ashleigh, like Emma, takes it upon herself, through certain schemes, to help her best friend find love, while along the way, finding love herself. 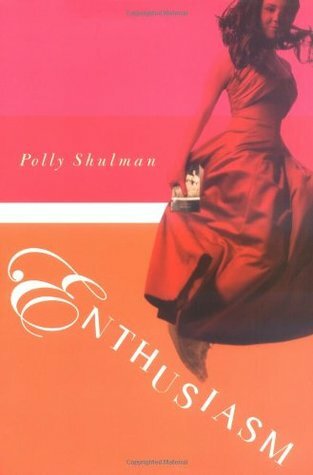 It's been around five years since I first ran across ENTHUSIASM by Polly Shulman. And, honestly, when I think about it, I'm fairly certain I got this recommendation from Stephenie Meyer's website way back in the day. I believe she had it on her list of recommended reads and I picked it up based on that and the fact that it had a Jane Austen angle. It seems like there are so many of those these days, but at the time I hadn't read many. I'm very glad I did pick it up, as this is a perfectly deligh It's been around five years since I first ran across ENTHUSIASM by Polly Shulman. And, honestly, when I think about it, I'm fairly certain I got this recommendation from Stephenie Meyer's website way back in the day. I believe she had it on her list of recommended reads and I picked it up based on that and the fact that it had a Jane Austen angle. It seems like there are so many of those these days, but at the time I hadn't read many. I'm very glad I did pick it up, as this is a perfectly delightful, perfectly quick read that entertains and leaves a grin on your face. I still don't see it around very much, but I'm happy to see Ms. Shulman has a new book that came out last year. Definitely need to go check that one out since I read this one in a single sitting. As far as the covers go, what do you think? I'm always interested to see where they go when they change it between hardback and paperback releases. I think it's interesting the slight shift they took on the paperback, lightening the background and adding the Austen figures to highlight that aspect of the story. Probably a good idea, but I do find myself sort of preferring the bright, simple colorblock of the hardback. The MC's BFF becomes obsessed with P&P and Jane Austen, and there's a tiny bit of Pride and Prejudice references: A Bingley, a Collins, but the male lead is no Darcy. There's also a play within the book and a play within the play within the book. Which is kind of fun. I enjoyed reading this book. There were shenanigans. I think our heroine has elements of Elinor Dashwood and Catherine Morland. I had a blast reading Polly Shulman’s novel Enthusiasm, her homage to Jane Austen’s Pride and Prejudice! It had been released in 2006 and was on my ‘to read’ list for quite some time until I felt the need for something summerish and light to read. Since it is classified as a young adult novel for grades 7-10, I was prepared to be underwhelmed by a less than sparkling plot and characterizations. My assumptions were so wrong! Totally! It is quite amazing to think that this is Shulman’s first novel I had a blast reading Polly Shulman’s novel Enthusiasm, her homage to Jane Austen’s Pride and Prejudice! It had been released in 2006 and was on my ‘to read’ list for quite some time until I felt the need for something summerish and light to read. Since it is classified as a young adult novel for grades 7-10, I was prepared to be underwhelmed by a less than sparkling plot and characterizations. My assumptions were so wrong! Totally! It is quite amazing to think that this is Shulman’s first novel! If you check out her picture on her web site she looks barley old enough to be ‘out’ in society!. Educated at Yale Univeristy as a mathematician, she obviously possesses both left and right brain skills! This writer is pea green with envy and is in total awe of this level of talent in one so young. Like Jane Austen, Shulman is all about language, social observation and characterization. It is easy to see why Austen is one of her favorite authors and how she inspired her writing. The book’s auspicious opening quote, “There is little more likely to exasperate a person of sense than finding herself tied by affection and habit to an Enthusiast” sets the tone of Austen-esque language throughout the novel that is respectful but not mimicy to Austen’s prose. The narrative is told from the perspective of fifteen-year old Julie, whose best friend since grade school is Ashleigh, an ‘enthusiast’. From Harriet the Spy to candy-making to military strategy, Julie never knows what or when the next craze will over-take her friend, but she is certain to be pulled into it. Now, her latest inspiration is also Julie’s passion, Jane Austen’s novel Pride and Prejudice. However, Ashleigh’s new possession of Regency manners and decorum mortify her conservative friend. Not only do they include speaking in Austenese, but wearing Regency attire to school, learning to country dance like her idols Mr. Darcy and Elizabeth Bennet, and ultimately, the ardent pursuit of her own true love. Ashleigh’s latest hair-brain scheme is to find their Mr. Darcy and Mr. Bingley by crashing a boy’s prep school dance! Knowing Austen’s world through her novels and movie adaptations was helpful, but not a prerequisite to enjoying this delightful novel. By following Julie’s 21st-century hardships, anxieties, mix-ups, and social blunderings we see that they are interchangeable with any 19th-century Regency Miss’ life; — for what young lady of any era does not wish, hope, and dream that a young gentleman will notice her, and return her affections? Julie has grown up her whole life with a best friend who is an Enthusiast. Whenever Ashleigh, Julie's best friend, finds a new craze she jumps head first, and rarely comes up for air. Her latest craze is non other than Jane Austen which she found when Julie lent her a copy of Pride and Prejudice. This craze has Ashleigh speaking in 18th century English, and only wearing long skirts or dresses because it is immodest to reveal the shape of one's legs. Her craze also involves a hairbrained scheme t Julie has grown up her whole life with a best friend who is an Enthusiast. Whenever Ashleigh, Julie's best friend, finds a new craze she jumps head first, and rarely comes up for air. Her latest craze is non other than Jane Austen which she found when Julie lent her a copy of Pride and Prejudice. This craze has Ashleigh speaking in 18th century English, and only wearing long skirts or dresses because it is immodest to reveal the shape of one's legs. Her craze also involves a hairbrained scheme to crash an all boys prep school dance in order to find their Mr. Darcy and Mr. Bingley. However, when the two girls end up falling for the same Mr. Darcy things get little tense. This was my second time around reading this book. I just finished my other one and wanted something to read, so I went to my shelf and picked this one up. Honestly, I forgot how much I loved this book. Its quick read, light, funny and just perfect for a few hour long distraction on a rainy day. As a sucker for rom coms and romance stories in general, I don't care how predictable it is, I love it all the same. Its one of those books that requires me to stop for a minute to relax my face because i This was my second time around reading this book. I just finished my other one and wanted something to read, so I went to my shelf and picked this one up. Honestly, I forgot how much I loved this book. Its quick read, light, funny and just perfect for a few hour long distraction on a rainy day. As a sucker for rom coms and romance stories in general, I don't care how predictable it is, I love it all the same. Its one of those books that requires me to stop for a minute to relax my face because it hurts from smiling too much. Its cute and I definitely recommend it for a quick pick me up. Super cheesy but super cute. I was in the mood for something just like it and i laughed out loud so much throughout the whole book. Julia's friend Ashleigh is so comfortable in her own skin you wish you were just like her but some of her ideas are so embarrassing. Some of the problem in the book seem so unrealistic and cheesy but the sad part is that they are totally true and are a huge deal in a teenaged girl's life . All in all theres no way after you have finished the book that you can help b Super cheesy but super cute. I was in the mood for something just like it and i laughed out loud so much throughout the whole book. Julia's friend Ashleigh is so comfortable in her own skin you wish you were just like her but some of her ideas are so embarrassing. Some of the problem in the book seem so unrealistic and cheesy but the sad part is that they are totally true and are a huge deal in a teenaged girl's life . All in all theres no way after you have finished the book that you can help but feel all warm and happy inside. Wow. I did not expect this book to make me laugh as much as I inevitably did. Things just get so chaotic, and the heroine heaps tons of crap on herself resulting in hilarious moments of: "what the heck!?" The end is precious and had me "aw-ing" out loud. Light, fun and a nice tie in to Jane Austen. This book walks on that thin line of sweet and clever, without becoming insipid and silly. I enjoyed the female characters willingness to be true to themselves and loyal to one another. It was so FUN to read this book. As dumb as it may sound I felt like a teenager with a "crush". My heart fluttered at the "first kiss" and I laughed out loud in parts of this book (which hardly never happens when reading). I look forward to reading this book again in the near future. I give it a 4.5 only because it was a bit too predictable...of course that's because I've read Austen's works. So, it was a bit comforting reading the familiar plots and storylines speckled throughout the book. Overall an enjoyable and quick read. Cute! It is funny for me to read about teenage angst now that I'm way past that age...I just want to say "Girls - communicate! Fight for what you want...". I went from "This is so stupid" to stupidly grinning. On se demande un peu pourquoi Jane Austen prend autant de place dans le titre alors que sa place dans l'histoire est si superficielle et anecdotique. Enfin ... on sait très bien que c'est pour mieux vendre et toucher un très large public. Ceci dit, c'est tout mignon et très rapide à lire. PS : Je croyais que la collection Wiz éditait des histoires de type fantastique mais là c'est clairement du Harlequin ! I waited for more than a decade to read this book. A freaking decade! And instead of getting a sweet romance inspired by Pride and Prejudice, I get this garbage. Ugh! I am so mad right now! More like 3.5 stars. I rounded up this time because something about this book captured me with its charm. Yes, it's an ode to Jane Austen. But it's also an ode to Shakespeare, poetry, literature, music . . . and high school. But one thing I loved was that the trappings of real life never change the main character's spirit and voice. Her Enthusiasm (ha ha get it?) never dies. I also loved that this ISN'T a book about two female friends torn apart over a guy. The plot is much more subtle and compl More like 3.5 stars. I rounded up this time because something about this book captured me with its charm. I also loved that this ISN'T a book about two female friends torn apart over a guy. The plot is much more subtle and complex . . . kind of like being a teenager. I read ENTHUSIASM shortly after its release in 2006 and, when I went searching for audiobooks for a recent roadtrip, I felt compelled to bring it along. Before I'd even finished the first disc, I remembered just how much I adore Polly Shulman's debut. I was so engrossed that I compeletely missed one of my exits and continued onward for about half an hour before I noticed. In fact, when I realized my error, I didn't even mind... it meant my trip was extended and I would have an entire extra hour I read ENTHUSIASM shortly after its release in 2006 and, when I went searching for audiobooks for a recent roadtrip, I felt compelled to bring it along. Before I'd even finished the first disc, I remembered just how much I adore Polly Shulman's debut. I was so engrossed that I compeletely missed one of my exits and continued onward for about half an hour before I noticed. In fact, when I realized my error, I didn't even mind... it meant my trip was extended and I would have an entire extra hour before I'd have to give up ENTHUSIASM! When selecting audiobooks I prefer contemporary YA with laugh-out-loud humor... and, of course, romance. That way, as I'm driving down the highway, I look insane. In all seriousness, I need a book that will keep me wide-eyed and engaged for hours at time, so I must choose carefully. Sometimes, I'll be so wrapped up in a story that, even after I've reached my destination, I'll sit in the driveway listening... ENTHUSIASM had me sneaking back out to the car when no one was paying attention, just to hear a few more chapters. Enthusiasts like Ashleigh are high spirited, stubborn, and, sometimes, crazed. When Ashleigh zeros in on the one thing Julie is actually passionate about, in her quiet, reverent way, she knows there's no use trying to dissuade her. Ashleigh plans on finding love. No, not just love, but true love, like Elizabeth Bennett finds in the scowling Mr. Darcy. I didn't have a friend like Ashleigh in high school, but I imagine my attitude would have been similar to Julie's. Though Julie often complains about Ashleigh's shenanigans, it's clear to the reader that she's fiercely loyal and loves Ashleigh despite her eccentricities. ENTHUSIAM celebrates a healthly relationships between best friends. Hurrah! I definitely don't take issue with the books that showcase dysfuntional friendships, but they do seem to crop up more often than than the former, so I'm always excited to find a relationship like Julie and Ashleigh's. It's difficult to discuss the romance in ENTHUSIASM with out spoilers, so I'll keep it brief. Swoon. To be back in high school experiencing my first kiss... This aspect of the novel was absolutely adorable. Julie's enthusiastic adventures are sure to keep readers (or listeners!) of all ages entertained. Julie's best friend Ashleigh is an enthusiast. She throws herself into her unusual hobbies so completely, she loses sight of all reason. In her fifteen years she has wanted to be a knight, a candy maker, and now a Jane Austen heroine. Poor Julie, always a loyal friend, gets dragged along into Ashleigh's schemes for better or for worse. Ashleigh decides that in order to find True Love, she and Julie are going to crash a school dance at a local boys' prep school. On the verge of being tossed out o Julie's best friend Ashleigh is an enthusiast. She throws herself into her unusual hobbies so completely, she loses sight of all reason. In her fifteen years she has wanted to be a knight, a candy maker, and now a Jane Austen heroine. Poor Julie, always a loyal friend, gets dragged along into Ashleigh's schemes for better or for worse. Ashleigh decides that in order to find True Love, she and Julie are going to crash a school dance at a local boys' prep school. On the verge of being tossed out of the boys' school for gate-crashing, they are rescued by their very own Mr. Darcy and Mr. Bingley. Unfortunately, the one thing Jane Austen did not write about is what happens when both girls fall in love with Mr. Darcy! Julie decides to be noble and try to ignore her feelings for her Mr. Darcy, but it's not easy when Ashleigh gets them involved in the boys' school musical! To complicate matters further, there's another suitor vying for Julie's attention (Mr. Collins maybe?) and even a high school Mr. Wickham preying on girls. There's a lot of miscommunication, embarrassing situations and angsty moments before the love knot can be untangled and Julie finds her Mr. Darcy. I liked the premise of the book and Ashleigh is an exaggerated version of me. I can totally see myself doing some of the things she does, short of crashing a dance and I absolutely loved the dancing scenes, thanks to my experience at a local Regency dance event. Though Julie is more quiet than Ashleigh, she has normal teenage problems and not so normal teenage problems, which make her more realistic and appealing than her friend. The boys are too good to be true but charming in their own way. There are some cute laugh-out-loud moments and sweet romantic moments that make this a good read for any girl who has ever dreamed of finding her own Mr. Darcy! If you like The Princess Diaries series, by Meg Cabot you will also enjoy this book. This review has been hidden because it contains spoilers. To view it, click here. Super Cute! I think I'm secretly a 15 year old girl trapped in a 30+ year old body. Julie and her best friend Ashleigh have been friends a long time. A tree separates their bedroom windows, and they frequently use it to visit each other. Ashleigh is always coming up with a new crazy fad that she jumps into 100%. Julie has seen this mysterious boy around town a few times, and she finds him very attractive. Ashleigh's latest scheme has them crashing a formal dance at the boy's prep school. (Oh, and Super Cute! I think I'm secretly a 15 year old girl trapped in a 30+ year old body. Julie and her best friend Ashleigh have been friends a long time. A tree separates their bedroom windows, and they frequently use it to visit each other. Ashleigh is always coming up with a new crazy fad that she jumps into 100%. Julie has seen this mysterious boy around town a few times, and she finds him very attractive. Ashleigh's latest scheme has them crashing a formal dance at the boy's prep school. (Oh, and Ashleigh is also obsessed with Jane Austen, so she talks and dresses from that time). At the dance they are almost turned away when Julie's mysterious stranger steps up and saves them. His name is Charles Grandison Parr and he introduces them to his friend Ned. All this would be fine except Ashleigh decides Parr is her Mr Darcy so Julie doesn't say anything of her own feelings. So the whole book is basically everyone getting to know each other, and some misunderstanding accompanied by a little family drama (Julie's dad remarried and she's not overly fond of spending time with them). This was an adorable book! I don’t normally go for the “chick-lit” kind of books, but this was really just fun and cute. Also, it was $1 at Books-A-Million…so it was hard to pass up. However, in my opinion the Stephenie Meyer recommendation doesn’t do much to sell the book. So, Julie and Ashleigh have this amazing friendship. Not only have they lived next-door to each other for their whole lives, but there is a tree that connects both of their bedroom windows. They can constantly go back and fort This was an adorable book! I don’t normally go for the “chick-lit” kind of books, but this was really just fun and cute. Also, it was $1 at Books-A-Million…so it was hard to pass up. However, in my opinion the Stephenie Meyer recommendation doesn’t do much to sell the book. So, Julie and Ashleigh have this amazing friendship. Not only have they lived next-door to each other for their whole lives, but there is a tree that connects both of their bedroom windows. They can constantly go back and forth to each other’s rooms, and do everything together. And they get a lot reasonably well, because of their respect and patience for each other. The main conflict in the plot is the mutual liking of one boy. However, this isn’t just a boy, this is Grandison Parr who is eligible, handsome, and (in Julie’s opinion) the perfect guy. Anyways, they both like him, but Ashleigh voices her feelings first, so she gets “first dibs” or whatever. The problem is, Julie has liked Parr ever since she first saw him, before she even knew his name. Now she has to try to be indifferent, to honor her friend’s feelings. I can relate to the whole “liking-the-same-guy-as-your-best-friend” thing, as it’s happened to me. I really liked the way this was handled in the book. The book is pretty predictable, but it’s so fun to read and the characters are so interesting, that it doesn’t really matter. Ok, I'll admit it: I'm a sucker for well-written YA romance. This book falls into that category; characters that seem relatively real, a romance that doesn't feel too far-fetched, and a plot that doesn't want to do much more than allow the characters to find each other (in other words, no causes and no massive misunderstandings/traumas to overcome). The plot is a mixture of Pride & Prejudice and Midsummer Night's Dream, with people falling for the wrong person or assuming the wrong person is Ok, I'll admit it: I'm a sucker for well-written YA romance. This book falls into that category; characters that seem relatively real, a romance that doesn't feel too far-fetched, and a plot that doesn't want to do much more than allow the characters to find each other (in other words, no causes and no massive misunderstandings/traumas to overcome). The plot is a mixture of Pride & Prejudice and Midsummer Night's Dream, with people falling for the wrong person or assuming the wrong person is interested in someone else. As in "Clueless", the Austen-esque bits are there for those that know the book (and if you haven't read P&P, do so now) but not overwhelmingly so, and the updates feel real. For once, this is set today, with e-mail and cell phones, something I'm starting to appreciate as I read more and more books written in the proximate past before either came into being. The 70s and 80s were nice, but really? Update the action, please. I read Polly Shulman's Grimm Legacy series of books, which were very sweet, and got around to reading her first young adult novel, Enthusiasm. This is exactly the type of book I would have loved as a young teen - romantically predictable and clever! The first sentence in the book starts it off well: "There is little more likely to exasperate a person of sense than finding hereof tied by affection and habit to an Enthusiast." Ashleigh is the enthusiast - someone who latches on to "brilliant" ideas I read Polly Shulman's Grimm Legacy series of books, which were very sweet, and got around to reading her first young adult novel, Enthusiasm. This is exactly the type of book I would have loved as a young teen - romantically predictable and clever! Under your window in the quite snow. If I can see your light before I go. All through the weeks I’ve tried to keep my balance. Leaves fell, then rain, then shadows, I fell too. Fall turned to Winter and I came to you. Kissed by the snow I contemplate your face. Oh, do not hide it in your pillow yet! If only I could see your silhouette. Turn on your light, my sun, my summer love.